I put together a mostly local dinner this evening. It started by tweaking a favorite recipe and making it the way I like it. After all these years of following recipes, I enjoy changing what is written into my own take, using the preferences that I have, and those of my husband. This is Mario Batali’s Spaghetti with Green Tomatoes. I know. No spaghetti. Not all the tomatoes are green. Where is the parmesan on top? Even the pesto is different. Here is what I did. I went into the garden and harvested as much arugula, basil and mint as I could find, to make about 3/4 cup. I came in and snipped off 1/4 cup of the curly parsley from the CSA, including some of the smaller stems. This gave me the cup of greens that I needed. I used 1/3 cup freshly grated Parmesan. And, 1/3 cup pine nuts, even though they aren’t called for in the recipe. Added a squirt of lemon juice and three roasted garlic cloves to the processor with the greens, parm and pine nuts. A teaspoon of salt. Half teaspoon of white pepper. Mixed it all while adding olive oil until it stopped clumping along the sides of the processor. That’s the pesto on the left. 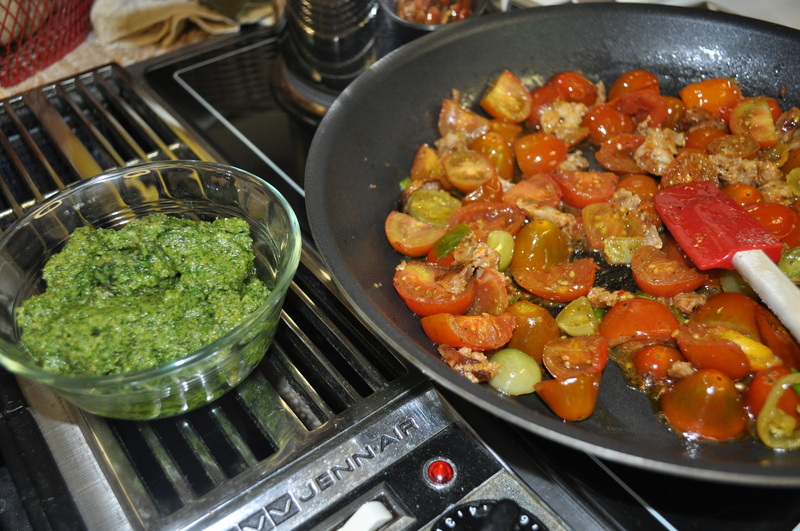 On the right, in the pan, about a cup and a half of underripe cherry tomatoes from the farmer’s market. They would have become fully ripe within two or three days. I did have three small green tomatoes from my garden in there too. They were cooked down in a little olive oil, with about four ounces of the hot Italian sausage left over from that grilling of the Breezy Willow sausage a few days ago. And, a handful of scallion tops, sliced. I added about half a cup of pesto to this mix. And, leftover goat cheese from the appetizer we had earlier. About two ounces of soft goat cheese, melted into the pesto and tomatoes. 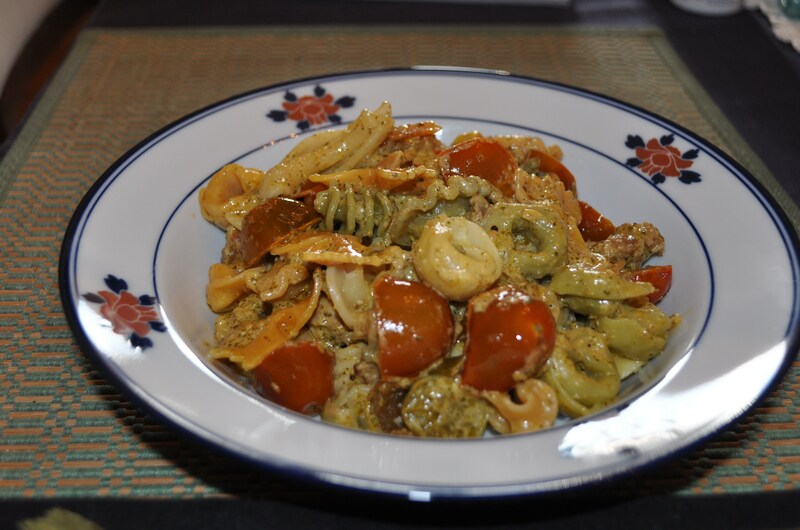 I made a cup of small assorted pasta shapes, and added them to the skillet, with a ladle of pasta water to thin the pesto. This is the skillet before I added the pasta. It coats the pasta well. 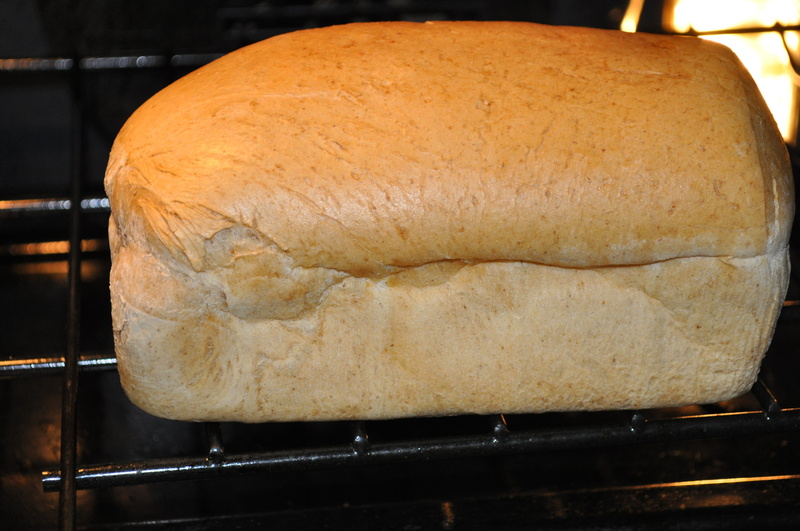 I put a loaf of Stone House bread in the oven to warm up. Served all of this with a lovely crisp Early Mountain Petit Manseng. We really like this wine. It cuts through the richness of that sauce. We had only tasted late harvest Petit Manseng before trying this one. Early Mountain has a winner with this grape. It has more body than a Pinot Grigio, but isn’t as heavy as a Chardonnay. 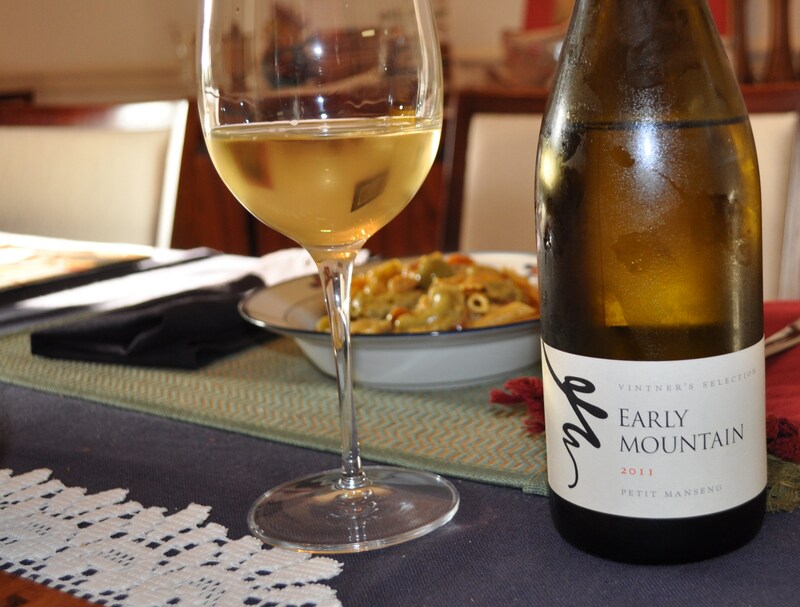 A perfect dinner wine. This dinner was so easy to put together. The pesto takes ten minutes, which included toasting the pine nuts. 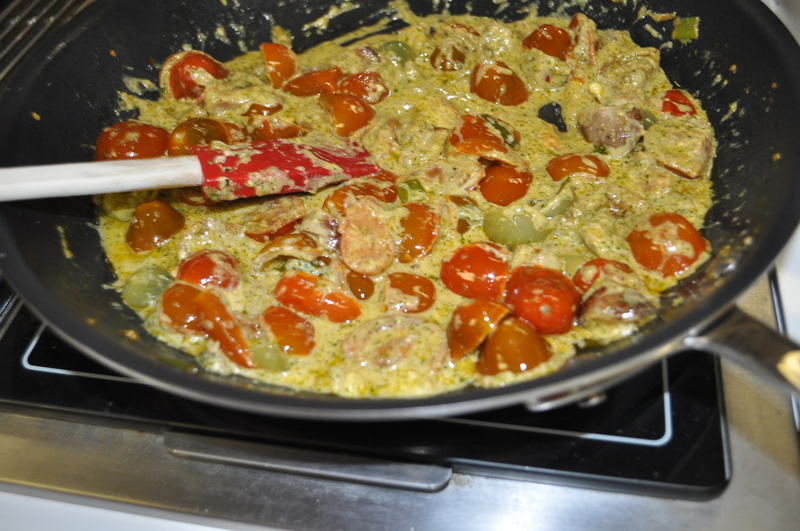 The pasta takes ten minutes to cook, while you are making the tomatoes in the skillet. Bread warmed in the oven while dinner was cooking. Posted in CSA, Farmer's Markets, Farms, Food, Gardening, Local Businesses, Locavore, Real Food, Wine and tagged cooking, CSA, farmer's markets, farms, Food, foodie, gardening, heirloom tomatoes, Howard County, local businesses, Locavore, real food, tomatoes, VA wine, wine. Bookmark the permalink. My, oh, my does this look AMAZING! Who needs Mario when you have Annie?